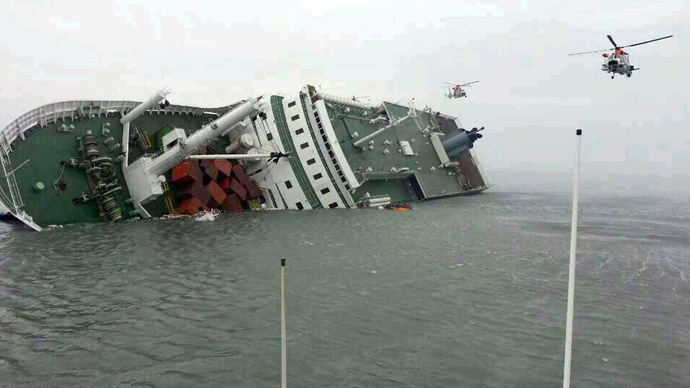 Footage has emerged which was filmed from inside the doomed South Korean Sewol ferry just before it capsized, as students deal with the terror of the situation with humor and bravado while sending messages to their loved ones. 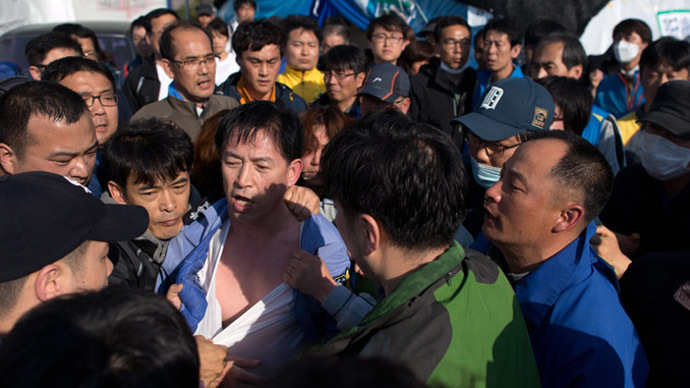 The video was found on a phone belonging to one of the students, 17-year old Park Su-hyeon. 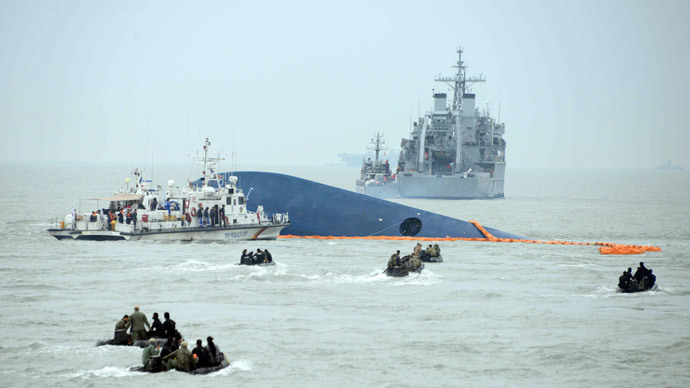 The video was released to South Korean television by Park’s father after the teenager’s body was recovered from the vessel by South Korean coast guard rescuers. All the faces of the passengers have been blocked out as many of their bodies have not yet been recovered. In the clip it is 8:52 am, April 16, and the ferry is getting increasingly unstable. Only one of the teenagers can be seen wearing a life jacket. By the end of the footage the ship’s tilting gets worse and everyone appears to be wearing one. The students are visibly startled by the events, but try to hide the unease joking about “defying gravity” and trying to walk on the walls as the ship lists. “This is like Titanic,” says one, while another replies “this is fun”. Several times the students are warmed over the loudspeaker to stay where they are. Meanwhile, the listing of the ship makes it more and more difficult to get out. As their situation gets increasingly perilous, some of them realize they must try and leave the ship before it’s too late. “I’m getting out of here”, says one of them. “Me too, me too” says another. “We have to survive now,” says someone else. More than two weeks into the disaster, over 210 people have been confirmed dead and a further 89 are still unaccounted for. 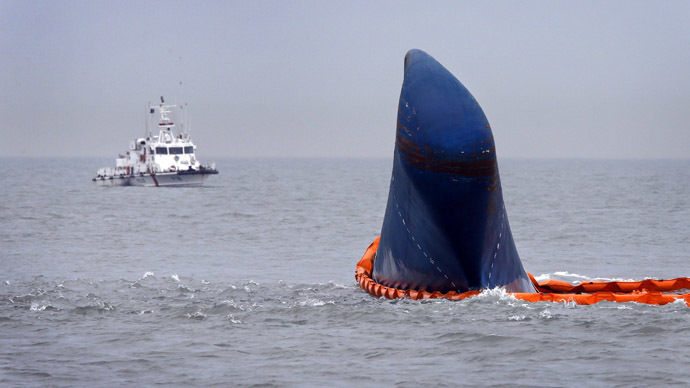 Some bodies have been recovered from as much as two kilometers from the wreckage of the ship due to the strong ocean currents leading to concerns that some bodies might never be found. The release of the video comes after news that 14 members of the crew have been arrested and that the owner of the ferry ignored warnings from an off duty captain that the ship’s stability had been compromised by a refurbishment which made it too heavy. The captain also warned that the ship should not carry too much cargo after the refurbishment. 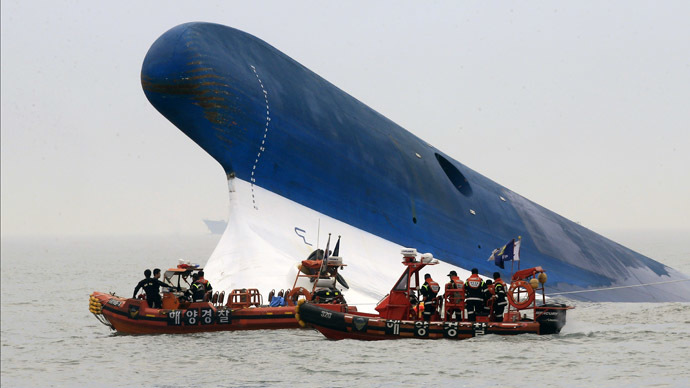 The Sewol was proved to have been carrying three times over its recommended cargo weight. Audio on ferry's speaker says "Don't move away from your places and brace for any possible accidents." A student says "Am I really going to die?" A curtain showing "It is not time to laugh. We are in a real situation." Another student says "Can somebody get the life jackets." Another student says "Why bother?" "We don't want to die." "I never thought the ferry would tilt." "It is now moving to the left." "It feels better now than before." "Why did the ferry suddenly tilt?" "There is a weird smell." "Can you catch me if I fall? "I really want to go down. It is scary up here." "I recommend you to not to go down." "Dad, I don't want to die." "It will be funny if waters flow in." "If water really comes in, we really have to get out." "Should I call my mom? I should say 'Mom, this might be the last (words from me)." "Is it really sinking? Wow, they are throwing life jackets. You wear a life jacket too." "We don't have any more life jackets?" "My zipper doesn't work neither." "We are missing one life jacket here!" "Did people outside wear the lifejackets?" "They didn't. They did not wear it." "We don't know how people on the veranda are." "What is the captain doing?" "This is going to be on the news. I can gurantee 100% that this is going to be on the news." "No it won't unless it sinks." "Mom, I love you. Dad, I love you. I love you both." Audio on ferry's speaker says "To Danwon High School students and passengers, please do not move away from you current position and wait." 02:37 A student answers "Okay." Audio on ferry's speaker says "For passengers who can wear life vests, please wear them now." "I don't know what's going on. If they are telling us to wear life jackets, doesn't it mean that it is sinking?" "It seem like I have to jump into the water." Speaker in the back says "Do not move from where you are." "There is a baby. This is crazy. It is real situation." "I need more life jackets."